Today's project is a thank you card using one of my favorite stamp sets. Lovely Amazing You - 140594. This is one of those treasures that is not found in the catalog but still available to order. It is not on the retiring list so double win!! 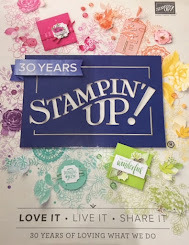 I am also participating in #acardadayinmay challenge hosted by Robyn from My Pink Stamper. This is my Day 4 card so I'm on a roll so far. It will be very exciting to see how many cards get created and mailed over the month of May!